University of Louisville Lions Eye Bank is a non-profit charitable organization serving the western half of Kentucky and Southern Indiana. Its team of compassionate medical professionals and volunteers are dedicated to restoring sight through corneal transplant, ocular research and medical education. Fostered and supported by the Lions of Kentucky, the Kentucky Lions Eye Foundation and in cooperation with the University of Louisville, the UofL Lions Eye Bank recovers, medically evaluates and distributes over 300 donor corneas and eyes each year for transplant surgeries and research. Corneal transplants are performed for treatment of conditions like Fuchs corneal endothelial dystrophy, corneal edema, and corneal scarring due to trauma or infection. The eye bank’s location near the major downtown Louisville hospitals decreases the time it takes to recover the donated corneas as well as deliver them, ensuring minimal degeneration. 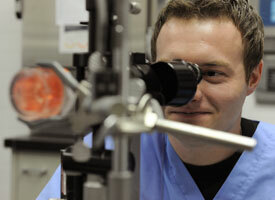 Through its affiliation with the University of Louisville Department of Ophthalmology & Visual Sciences, the eye bank obtains and processes tissue for research and the practice of surgical techniques. Visit the UofL Lions Eye Bank online at https://kylionseyebank.org for more about the bank, our donors, corneal donation, and how to donate. 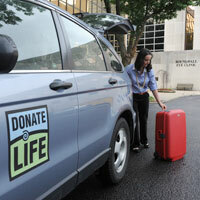 By clicking the link below, you will be taken to the Kentucky’s Donor Registry website. This is a secure site where you can sign up online to become a donor. To register you will need either a driver’s license or state issued ID.